obtained a $35 million settlement on behalf of more than one hundred businesses and individuals in a class action in the Bridgeport Fire case in Montgomery County. These are just a few of the eye-popping results Shanin has achieved. But it is not just about the size of the awards in the cases Shanin has handled. With the support of his clients, he has used his litigation skills to accomplish beneficial social change. In a case involving brain damage from a defective BB gun, Shanin was instrumental in persuading the U.S. Consumer Product Safety Commission to recall more than 7 million defective Daisy BB guns. And in a case involving a pedestrian run down by a speeding Philadelphia police car, Shanin won not only monetary compensation for his client, but brought about a mandate for extensive new training and driving rule changes to improve police and civilian safety. In another matter where campus police failed timely to revive a student who had collapsed in class, Shanin negotiated a settlement which included, in addition to monetary compensation, an agreement by the University to hire a medical director for their police department and provide police officers with quarterly refresher courses on CPR and the use of automatic external defibrillators, with regular proficiency testing. These efforts reflect Shanin's belief in our justice system as a necessary check on the occasional excesses of a free enterprise system. As our federal government has taken an increasingly hands-off approach toward business, and has insufficient funding and personnel to regulate commercial activity effectively even when the political will is present, it is often only the courts that can force a wrongdoer to account for its actions, and impose penalties that may change future behavior and prevent future injury. No one recognizes this powerful truth better than Shanin, who consistently utilizes the court system to level the playing field and restore balance for the disadvantaged. Shanin does not start the fight; some one else does by causing injury to his client. But he will finish it, on the strongest terms permitted by law, maximizing the clout arising from superior case preparation and exceptional trial skills, in the best interest of his client and with a nod to larger considerations of social justice. And he will do this with meticulous attention to professional courtesy and compliance with court rules. For Shanin the success of our civil justice system is a measure of the fundamental decency of our society. "I think the mark of how civilized our country is how we treat the weakest among us," he recently observed in a media interview. "And that would mean people who are at the beginning of life, the end of life, people who are accused of a crime or who are incarcerated ... [and] the people who are terribly injured." The late Judge Edward R. Becker was famous for saying that you're only as good as your last case, suggesting that one cannot rest on his or her laurels in order to achieve continuing excellence. Like Judge Becker, Shanin does not depend upon his past accomplishments to obtain great results, but prepares every case as if it were his first. As he has said, the jury couldn't care less about what a magazine or organization says about the lawyers in the case. You have to prove yourself all over in every case. I like that. I don't want to win for some collateral reason like reputation, or name. I want to win because the cause is just. Shanin's determined and fearless pursuit of justice honors the memory of the legendary figure for whom our Association's highest award is named. Justice Musmanno's lifelong struggle against injustice, and his particular concern for the rights of ordinary working people, are also attributes of Shanin Specter. And just as Justice Musmanno had the courage to speak out against conservative judges who routinely diminished or extinguished the rights of injured victims in Pennsylvania courts, so Shanin has taken on cases and causes that, one by one, have advanced the cause of fairness and justice for all of us. Justice Musmanno's interests extended beyond the law: he wrote sixteen books, a play that became a movie, and was proud of his family, ethnic heritage and religion. So it is with Shanin, whose diverse interests include history, baseball, religion, and politics, who plays squash nearly every day, and who above all else is devoted to his family: his wife Tracey, their four daughters, and their parents and extended family. Shanin is also active in his community, and committed to many charitable endeavors. In his spare time, he serves as an adjunct professor at the law school of the University of Pennsylvania, where he teaches trial advocacy. Shanin's life is a model of how one can live fully in many ways, doing well by doing good. Shanin's partner Tom Kline is familiar not only with Shanin's skills as a trial attorney, but with his other special qualities that make him a deserving Justice Musmanno Award recipient. He explains "My law partner Shanin is a brilliant courtroom advocate and represents the best of the best among trial lawyers, but what most sets him apart is his unequaled sense of fairness, along with his balance, commitment, empathy and passion for the work to which we have all devoted our professional lives. There could not be a better role model, and no one could deserve this coveted award more than he." Shanin's outstanding results and success have been recognized repeatedly. He has again this year been named among the top 10 lawyers in Pennsylvania by the Super Lawyers organization, has been designated among the best 500 attorneys in the nation by Lawdragon and is a member of the exclusive International Academy of Trial Lawyers and a Fellow of the American College of Trial Lawyers. He is the 2007 recipient of the Pennsylvania Association for Justice's Milton D. Rosenberg Award, and a long-time and extremely active member of the Board of the Philadelphia Trial Lawyers Association. Shanin has also served as Chair of a Hearing Committee of the Disciplinary Board of the Supreme Court of Pennsylvania, a member of the Supreme Court's Civil Procedural Rules Committee, and as the Governor's appointee to the Pennsylvania Medical Professional Liability and Insurance Catastrophe Loss Fund Advisory Board. Notwithstanding his material success, Shanin continues to be an active, hard-working trial lawyer, who remains as devoted to fighting for the rights of victims as anyone in the proud history of Musmanno Award winners. But if his selection for this honor is recent, his commitment to our cause is not. In the mid-nineties, the term trial lawyer was acquiring increasingly negative connotations from a conservative political establishment who referred to us derisively as the "tasseled loafer" crowd. We needed to respond to these offensive characterizations to prevent our jury pools from developing a bias against our clients before they even knew what the case they were about to decide was about. Shanin was presented with PTLA's President's Award in 1996 for developing a powerful series of radio commercials explaining what trial lawyers really do to serve individuals and society at large. 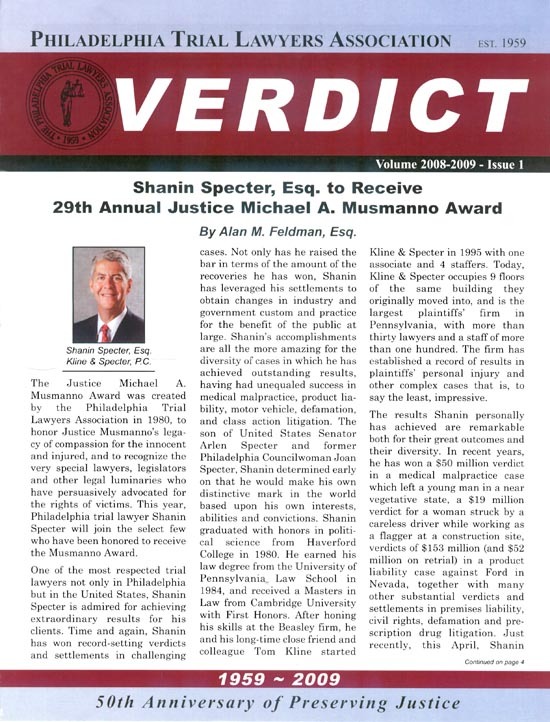 In 2008, the Philadelphia Trial Lawyers Association is again pleased to recognize the distinguished accomplishments and contributions in the pursuit of justice by our friend and colleague Shanin Specter, who is most deservedly this year's winner of the Justice Michael A. Musmanno Award. All members of the bench and bar are invited to attend this dinner on Thursday, October 30, at The Park Hyatt Philadelphia at the Bellevue. The cost is $150.00 per person which includes cocktails from 5:30 p.m. to 6:30 p.m. Please visit www.PhilaTLA.org or call (215) 732-2256, for more information.